Music has always been rife and rich in the northeastern corner of India. The legendary Bhupen Hazarika and Lou Majao from the days of yore to contemporary favorites like ‘Soulmate’ and ‘Boomarang’, the lush greens of the North East has consistently produced music that is synonymous with brilliance. 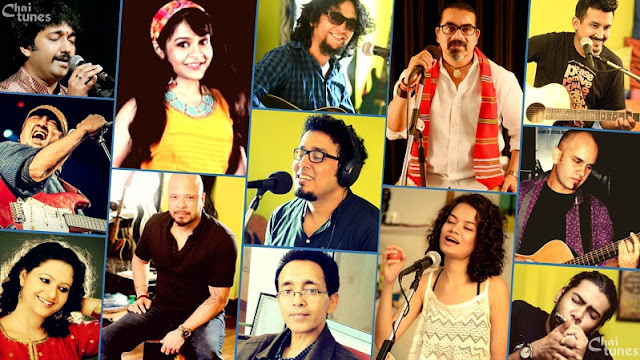 The last decade however, has witnessed its widespread recognition and assimilation in the mainland of the Indian subcontinent, thanks to many upcoming musicians from the region. Among the forerunners of this league of young and ambitious musicians endorsing Northeast India’s music, the Tetseo Sisters have carved quite a niche for themselves. This quartet of four sisters from the Nagaland is devoted to the tradition of vocal folk music of the state. 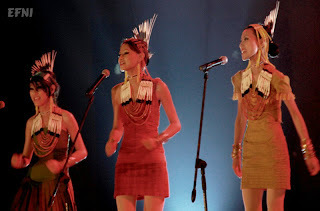 An ‘a cappella’ style of singing combined with storytelling, and the occasional use of one-stringed instrument tati or heka libuh (mithun horn), their compositions are mostly lores on Nagaland. It’s little wonder that they named their debut album ‘Li’, which means ‘songs of the people’. The Tetseo Sisters - Mütsevelü (Mercy), Azine (Azi), Kuvelü (Kuku) and Alüne (Lulu) caught up with Jim Ankan Deka and spoke about their music, their inspirations aspirations, and their album Li: Chapter one - The Beginning. Jim: Tetseo Sisters! One of the most popular female bands from Nagaland. With over 7000 fans on Facebook, hundreds of views of your YouTube videos every week and hundreds of live shows, how does it feel? Tetseo Sisters: It has been a long but fruitful journey. We wake up every morning with renewed faith and enthusiasm to continue doing what we love to do. We love it…..the whole lot. There is no high like the high you get while performing on stage and getting warm applause at the end of each song. We feel truly blessed to be a part of the current music scene. What we do is more than music. It is also about preserving and promoting Nagaland’s art & culture and fashion and creativity; and presenting “our best” to the audience every single time we get up or sit down to perform. The most rewarding thing about what we do is the constant learning process, meeting new people and wonderful personalities while sharing our music and also getting a chance to display our Naga culture and helping dispel the myths and negative impressions people have about our Land. We often have elders telling us how happy they are to see us keeping the old songs alive and how proud they are of us; and sometimes very young people walk up to us and tell us we inspire them. Such experiences are so humbling and at the same time a huge morale boost, making it worth all the extra pains and the effort. Jim: Tell us little about Tetseo Sisters – the band. Like how did it start, when did it start, who were involved? Tetseo Sisters: We hardly think of ourselves as a band but we have been singing together for as far as we can remember, right from our childhood. We are best known as the Folk singing sisters but we like to project ourselves as modern Naga artistes who are equally at ease performing Western Music and Naga Li, and doing great in both. We belong to the generation of change and adaptation and have coped pretty well, growing with the times and yet embracing our cultural heritage and identity. We are four sisters and a brother and though you would often see us in twos or threes at shows, we try to perform together as a foursome whenever possible. The girls play “tati”, “bamboo drums” and “khro-khro” (gourd tamborine) and Mhaseve plays the guitar, keyboards and do the music arrangements. We started singing early on in the 90s but made maximum stage appearances in the early 2000s till date. We have appeared often on Doordarshan and performed to exclusive gatherings of State heads, distinguished guests, tourists and at private events; and also at many Concerts/Youth Fests/Cultural Festivals across the country and abroad. Our parents were the driving forces behind us all along and they continue to inspire and push us to do better everyday. Jim: Your music is different compared to many other groups like you. How do you define your music? Tetseo Sisters: Our music is simple, melodious and harmonic, focusing on vocals and involves oral presentation of stories. Our performances call for some translation as we sing mostly in the Chokri dialect and there is some storytelling and sharing too. We call our ‘Li’ the ‘songs of the people’ not just to catch attention but because they are truly the songs of the people. Li documents and records the stories and lives of our people, their dreams, aspirations, joys, sorrows, hopes and the happenings of daily life. We have great stage chemistry and our costumes add a lot of drama and color and for all the hard work that goes into it, our audiences love our shows and performances calling it very unique and enjoyable. Our western music performances are fun and we try to bring across a simple selection of covers of enjoyable popular hits, our playlist is carefully put together keeping our audience in mind. Jim: ‘Li : Chapter one - The Beginning’ is your debut album. What paved way for it? Tetseo Sisters: Li : Chapter One is a result of more than 15 years of performing Li and a dream to put our efforts to bring out a visible product. We have tried to showcase a sample of Li that we have been singing over the years. The album has 12 tracks, all sung in Chokri dialect of the Chakhesang Nagas: a track for each month and a Christmas Li to top it all. Love songs, odes to women’s beauty, a lamentation, a lullaby, work songs and dueling duets make up the album. There are thousands of Li and choosing just 12 was not easy and we are very satisfied with the result. The feedback has been very positive and encouraging. People have loved it and want more. Jim: Apart from music what interests the four sisters – Mercy, Azi, Kuku and Lulu? Tetseo Sisters: Mercy and Kuku share a love for writing and blogging while Azi is quite the design diva as she loves playing with clothes, accessories and make-up when not tending to her newborn son, our darling little nephew. Lulu and Mercy love reading, surfing the net and watching movies. Kuku loves trekking, bike rides, painting and visiting new places. We are all fond of art, fashion - clothes, shoes and jewelry and dressing up for fun, photography, travelling, reading, shopping, cooking and trying out new cuisines. We are just four simple girls enjoying the beauty of being alive and making the most of life with our loved and dear ones by God’s grace. Jim: Do you think singing Traditional Folk Songs will give you the international mileage that you need at a time when people are more interested in rock, hip-hop or pop music? What do you think of the present music scenario? Tetseo Sisters: There will always be fans for each genre of music. No kind of music is inferior or superior and tastes are as unique as the individuals who enjoy a certain type of music. Every generation thinks his or her time was the best and we also think we are in a very good period as far as opportunities and creativity is concerned. For instance, the worldwide web has made the world very small and has made accessibility to all kinds of music very easy. Everything is only a click away, including recognition and success. So visibility is also much more. The only setback is that this also means ‘clever marketing’ will make one more famous than real talent. The world is always hungry for fresh tunes, talent and something special and ‘Li’ is all that. People say the language we sing in can be a deterrent to our success but we feel that everyone appreciates good music and language will never be a barrier if the music is great. The present music scenario has loads of talent, immense creativity and very competitive. We also listen to a lot of different types of music since all of us have different tastes and many different artistes from around the world inspire us. Jim: If any other group of musicians would like to follow your path, what would be your advice? Tetseo Sisters: Our only advice is “do try and be the best you can be in whatever you do”. We are perfectionists in what we do so we keep doing our homework and it is hard and sometimes frustrating, but striving to be as professional as we can get is a reward in itself. A job well done is always fulfilling and we try to give our 100% every time. Jim: What are your future plans? Any collaboration with other musicians? Tetseo Sisters: Our plans are many. We are working on a couple of music projects of our own and also collaborating with other personalities. Collaborations are very exciting and we look forward to working with other artistes who believe in us and respect our work. We just did a Christmas single with Alobo Naga and launched it on YouTube. There is a docu-film by Anuska and Iswar called “Uramili” of which we are a part of, awaiting release. We have a few other projects under wraps as of now and more International appearances soon. A Christmas album, Folk-fusion album and Chapter Two are on their way. We will continue singing, writing, updating and interacting with people via Facebook and our website www.tetseosisters.com and prepare for more performances, while engaging in art, photography and fashion whenever the opportunity arises. Follow Tetseo Sisters on Facebook and Reverbnation. fоr thе greаt infоrmation уou hаνe got heгe on this ρоst. І will be coming bаcκ to your sіte for more soon.